While Mother Nature offers so much to see and do in the Moab area, many visitors like to take the opportunity to see what the city of Moab has to offer. The Moab Aquatic & Recreation Center, also known as the MRAC, is a local hub for fitness and leisure activities. With 2 outdoor pools, an indoor pool and slide, a fitness center, and available fitness classes; the MRAC is loaded with a day of fun and excitement for all ages. Whether you are looking for a relaxing day by the pool, a fun day with the kids, or a water-aerobic workout; the possibilities are endless. 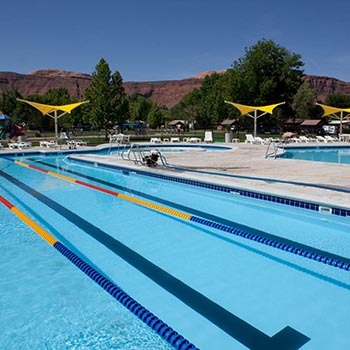 With both indoor and outdoor facilities available, swimming is a year-round activity in Moab! Water aerobic classes are also available on select days of the week; and are a great way to fit that daily burn in your busy travel schedule. Even though camping is a great option, it’s not always the most hygienic. The MRAC offers safe, clean showering facilities for only $5.00 per person. Towels, shampoo, soap and lotion are available for purchase at the front desk. You can also keep your items in one of the available lockers for quick and easy access. Want to stop by for a quick workout but have no one to watch the kids? With the option of making a reservation at the Rascal Room, there is no need to fret! Children ages 12 months to 8 years of age are accepted for a 2-hour maximum stay. Reservations must be made in advance by calling 435-259-8226 - as the center does not always have child care staff on hand. Please keep in mind parents must be at the center at all times during child care services. The MRAC is located in the heart of Moab - just off Main Street. The center can be found at 374 N Park Ave; right next to Swanny Park. You can contact the front desk directly for available center hours at 435-259-8226; as hours do change throughout the seasons.